You will be given a reference e-book to read which has 204 pages And the test will be based on that e-book , you can take final test within 1 year of purchase. Our entire civilization is facilitated and made possible by mass communication. The exchange of lots of the knowledge, ideas and ask Russian is how society comes together to create something greater than its parts. Communication is the key to civilization. In the business world, is just as important to have these communications skills as it is for society as a whole. Communication skills are important in so many fields and that so many authoritative levels throughout any business environment. The ability for company leadership to exchange ideas, and here of status of their business, the objective for managers to hand down direct this and govern processes, and finally the ability for the staff to conduct it processes, exchange information and report back to those above them. Communication skills are necessary in public relations, politics, marketing, sales and customer relations as well. A company must communicate their presence and services to the consumer base, they must be able to exchange with this consumer base, and continue to innovate and ensure mutual benefit. The list could go on, on how important communication skills are in a professional environment. It would fill volume in fact. It's needless to say then, all things considered, communication skills are something that are sought after in applicants for just about any job. A certificate in communication skills shows many important fact in a productive employee at any position or level in a business. This means that anyone wishing to live a career oriented life should study communication. Communications skills improvement is always a noble pursuit for anyone already in a profession as well. Both of these goals can be reached through a communications skills certification. The absolute most efficient way to obtain this certification is through online certification. Online certification eliminates the classroom, and is more affordable due to the elimination of expensive tuition. A busy professional can study on their own time, with still plenty of time to live their life, thanks to the convenience of the Internet in online certification. It's important to choose the right online certification provider, because some are superior to others, and following this logic, there is one which is bound to be the best. Brainmeasures is the best online certification provider around. Retaining the most highly skilled course design professionals, Brainmeasures creates scholastic material of the caliber of a university. We work closely with experts in fields we teach, and they help us to ensure that our courses are as inclusive as possible. We take another step, however, and here is how we are not only the best, but the most cutting-edge as well. We use the experience that these experts convey through their stories, to use as teaching models and the samples, and place upon our students a level of experience that entry-level people seldom have. This certification consists of our communications skills course, followed by our online communications skills exam. Upon passing the online communications skills exam, a certification is awarded. 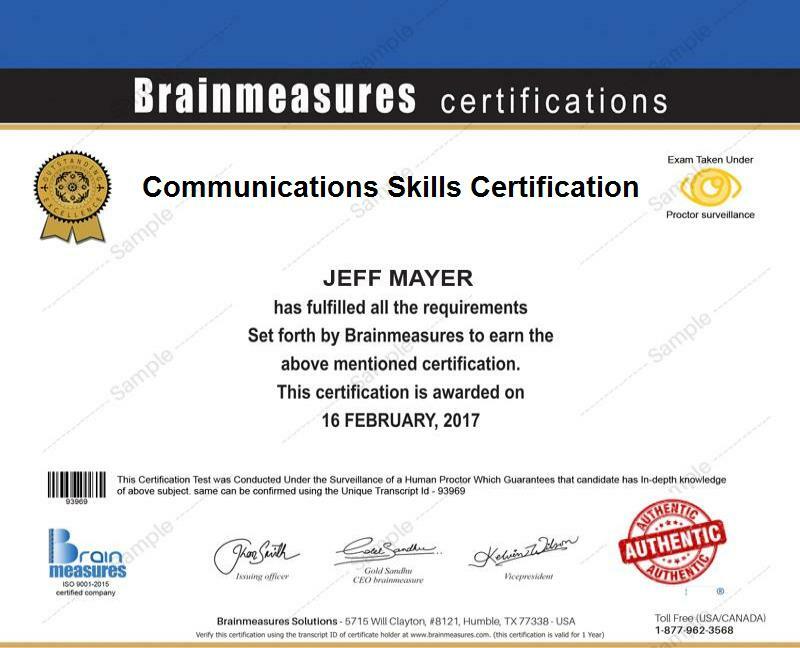 This is the Brainmeasures communications skills certification. This certification is more valuable than gold.. This course is for everyone. Anyone wishing to succeed in the business world, no matter their interest, no matter their level of position – everyone should take a communications skills course. It is just a guaranteed improvement in life. The salary range for this course is also by far the widest. Due to this being a course to improve business skills in general, it is easier to only look at those careers that are oriented specifically around communication. Fortunately, those fields pay fairly well. The range for communications oriented professions is between $90,000 a year and $480,000 a year.